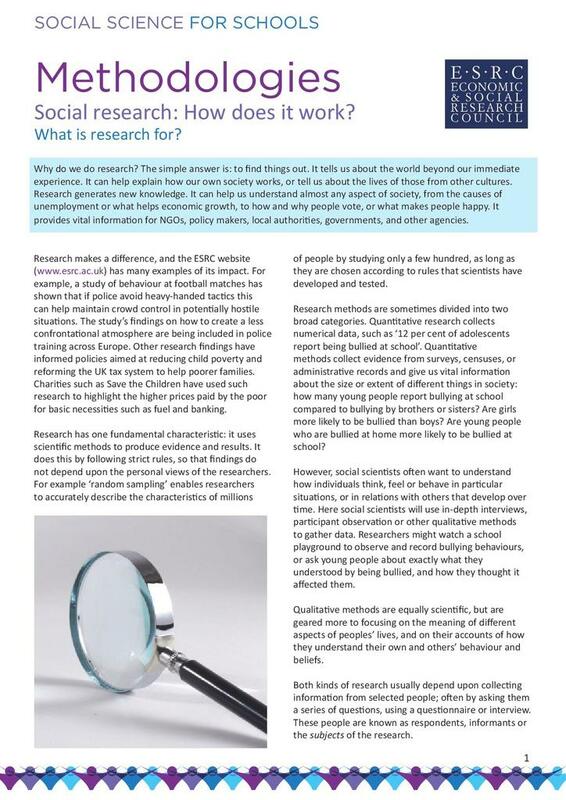 Social Research: How Does It Work? What Is Research For? This resource looks at what social researchers do and why they do it. Research is recognised as vital for expanding our knowledge, providing vital information for government and other agencies, as well as helping us to understand our own society and those societies which are beyond our own experience. This information sheet concentrates on qualitative and quantitative methods of research, explaining what they are and what methods and terminology are used. This resource was developed by the Economic and Social Research Council (ESRC), a part of Research Councils UK (RCUK). Please be aware that resources have been published on the website in the form that they were originally supplied. This means that procedures reflect general practice and standards applicable at the time resources were produced and cannot be assumed to be acceptable today. Website users are fully responsible for ensuring that any activity, including practical work, which they carry out is in accordance with current regulations related to health and safety and that an appropriate risk assessment has been carried out.